The background to Hastings is well known, with an English king (Edward the Confessor, who had spent years before his crowning exiled in Normandy and encouraged Norman interests to off-set local rivals) dying childless. The England of the day actually made accession a “vote” of the most powerful lords and Harold Godwinson was the overwhelming choice...but not without exterior rivals. Harold III of Norway (commonly called “Hardrada,”) brought up an accession vow issued by Edward’s predecessor, Harthacnute, the one Viking who actually had ruled the whole British Isle. William of Normandy, (where Vikings had been intermingling and expanding since invited to settle in 911 A.D. by French ruler Charles the Simple - who certainly earned his title) claimed Edward had promised him the throne while exiled and that Harald, who had been William’s “guest” after a shipwreck, and sworn to uphold the promise. Both Harald and William gathered forces to press their claims, Harald picking up a disaffected brother of the English king for local support. Harald landed first and lost, at Stamford Bridge. Harold had really been more prepared for William’s naval invasion, which was delayed through a com- bination of bad winds and (perhaps) savvy tactics. Though seemingly ready to sail in August, William did not depart until September 20, by which time Harold had dismissed his militia (fyrd) so that they could harvest their crops. William had also taken the time to bribe the Pope and gain support for the “righteousness” of his claim. This paid dividends later. 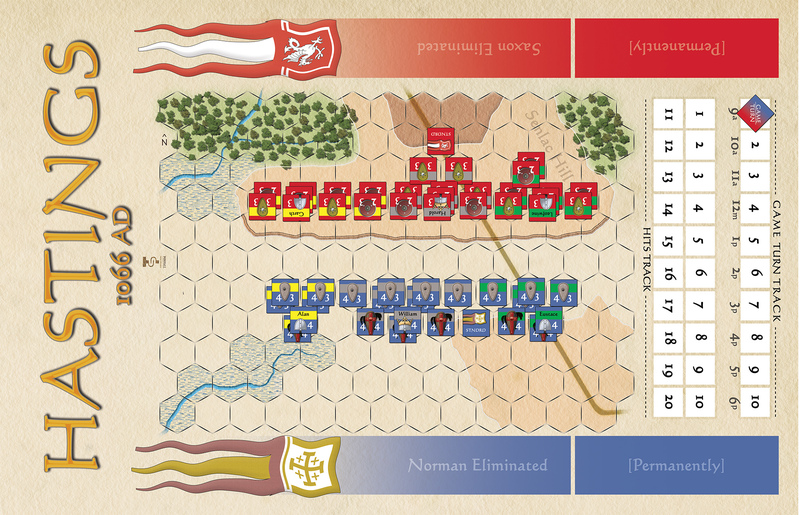 William landed with little opposition, set up a defensive beachhead, and began pillaging the surrounding area, both to appease his troops (at least half of which were mercenaries) and to pressure Harold to respond quickly. Harold did, bringing the remnants of his battered army all the way from York in a march that would be considered legendary (if they had won.) The inside story is that Harold’s brothers suggested he remain in London, raising more troops, while they took the tired or hastily gathered troops to Pevensey. If they beat William, end of story. If they lost, Harold would be ready with another army. It was the smart move, but analyzing Harold’s mind-set suggests that the Papal Banner William carried really affected him, and he looked forward to head-to-head battle to decide the issue - “trial by combat” in a large scale. 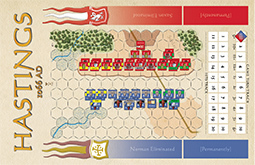 Tactics of the battle are well known. Harold tried to surprise William in camp but good recon foiled that plan, so Harold lined his army up on the best ground he could find and dared William to take it from him. William had many ad- vantages - a far more professionally trained army, a mix of infantry and cavalry, and far more missile weapons at his disposal. He would need all of them, as the mixture of farmers and housecarls managed to create a shield wall that turned back every Nor- man attack - until the Normans hit on the idea of faking a retreat and encouraging the defenders to break ranks in pursuit. Together with flocks of arrows, the English army was worn down until Harold was killed (though whether it was an ‘arrow in the eye’ is highly disputed) and the defenders broke. Further details are sketchy, and, despite the location of an Abbey William is said to have ordered built “on the site of the battle,” even the actual location has been disputed lately. While William expected the country to yield after the battle, the English persisted longer than is common- ly recognized. They actually elected a new king, Edgar the Aethling, and managed several battles that delayed William’s advance and accession. 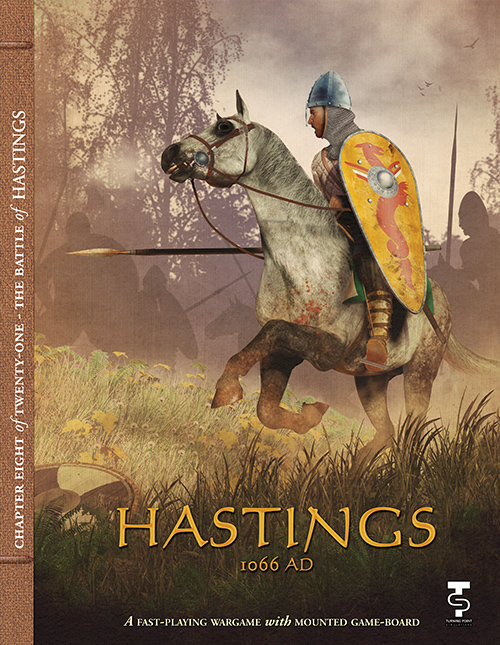 Though Hastings ended at dark on October 14th, it was not until Christmas Day, 1066, that William was crowned king. William's rule was ruthless, brutal, and largely absentee, as he spent much of his time defending or expanding his continental holdings, leaving England in the care of an expanding nobility who created a castle and formal feudal society. 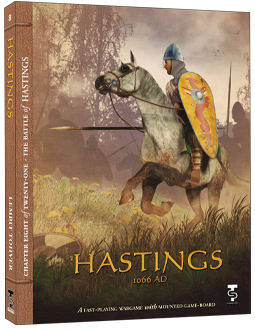 Or perhaps you can resist the Normal Conquest and lead the mighty Anglo-Saxon realm to future greatness. About the Designer: Lembit Tohver is a Canadian wargame enthusiast since 1967. His experiences while serving with the Canadian military (early 70's to early 80's) and courses in game theory (taken while at university) have provided him with the valuable skills that he uses as he currently serves as the chief game developer for both Against the Odds Magazine and the L2 firm. History has always been a passion with him as well as game systems. He is the proud father of both his grown-up son and daughter. His major bane since starting to game is his dice rolls. Need a 1, rolls a 6. Needs a 6, rolls a 1. Favorite saying "MEH": Make Everything Happen"